Kitchen and Residential Design: No mo snow! Enough already. I have to get to New York tomorrow morning and this nor'easter nonsense isn't helping. Oh you poor Floridian! But seriously, I couldn't deal with this stuff if I hadn't been born up to my ears in it. I'm a native Pennsylvanian, so I remember all too well what winter weather looks and feels like. After nearly 20 years as a Floridian, it's sometimes nice to revisit what drove me south in the first place. Ugh. Thanks Brenda, I appreciate your warm thought. The photo above was taken this morning in Times Square. Susan Serra, another attendee a tthis stories event just sent me a photo of the corner of Columbus Ave and 72nd Street and it looks like there's about eight inches on the ground. Not enough to make everything come to grinding halt, but it's just enough to be a nuisance. Snow is delightful when you watch if fall gently on a wooded meadow as you sit in front of a cavernous fireplace sipping hot cocoa. 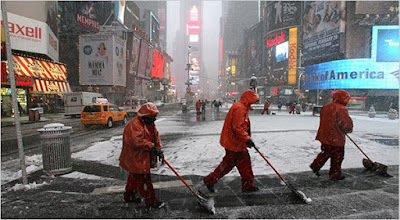 Trudging through its dirty, slushy aftermath on city streets is another story entirely! Only an event like Brizo's could get me to NYC in February. What evil fashionista thought this would be a good time of year to look Fabulous, Dahlin' in the Frozen Apple? Still jealous... maybe a little less now! I agree Jamie, snow's a delight when it's appropriate. Now is not appropriate. How's the winter in Chicago been Michelle? I'm finalizing my trip details KBIS now. I'm already psyched up! Well we got hit pretty bad yesterday. Took me 15 min to remove the snow and ice from my car last night... tons of fun. Every time we have weather like this I wonder why I moved back from Phoenix! Downtown in the summer by the lake makes it all worth it. I won't be in my showroom much during KBIS (Ill be downtown Thurs, Fri and Sat-- maybe Sun) but let me know if you can make it up and I will make sure my assistant gives you the cooks tour! Let me know if there are specific times you will be at the Google booth and I'll stop by. I will have a schedule for my presentations in another week or so and will keep you posted. Are you working the show or participating? I'm packing my wellies and I'm ready to go: American Airlines, get me there! I dug out my Doc Martins! Me, too: adrenaline has kicked in big time! I have two deadlines for Friday and I don't even care for a change! Start spreadin' the news! I am participating in the show... I have quite few meetings and events to attend so I typically go all three days and this time around I am attending a class on Thursday.